Scars are extremely common. They are part of the body's natural healing process, and can be caused by injuries, medical procedures, burns, skin conditions like acne, and other forms of physical trauma. Due to the widespread nature of scarring, there is high demand for effective treatment options. Coconut oil may reduce the visibility of scars and improve the skin's overall appearance. Living with scars can be difficult, especially if they are in a visible location or bring up painful memories. Thankfully, there are a number of possible treatments. That includes getting rid of scars naturally using home remedies such as coconut oil. The oil is a popular method to try to reduce scars. It has been praised by dermatologists and beauty experts alike. Coconut oil has many uses, from makeup remover to hair conditioner, and even scar management. Its use as a skin treatment is nothing new. It has long been linked to Indonesian folk medicine. Dr. Bruce Fife states in "Virgin Coconut Oil: Nature's Miracle Medicine" (Chapter 1, page 7), that coconut oil is often referred to as a "drugstore in a bottle" in the Philippines. It may help reduce the appearance of scars thanks to the natural presence of vitamin E (an antioxidant used to speed up skin recovery) and medium-chain fatty acids (like lauric, caprylic, and capric acids, which improve healing rates by stimulating collagen production). Coconut oil can diminish the appearance of existing scars and minimize the effects of more recent issues. Old scars can be lessened thanks to the medium-chain fatty acids. The oil is able to help minimize new scars from forming due to the added moisture it provides. It eliminates peeling, blistering, and may even help prevent scarring. When using it on your skin, experts suggest using cold-pressed virgin coconut oil (or VCO). Every scar is different. Some are harder to remove while others respond quickly, depending on the severity and age of the scar. In an article for The Huffington Post, "Why Do We Scar?," Robert Tornambe, M.D., says it is important to be proactive with treatment during the early phases of healing, and that early on scars should be massaged vigorously with a moisturizer. If you choose to use coconut oil to help minimize the final appearance of a scar, it should be used early on. 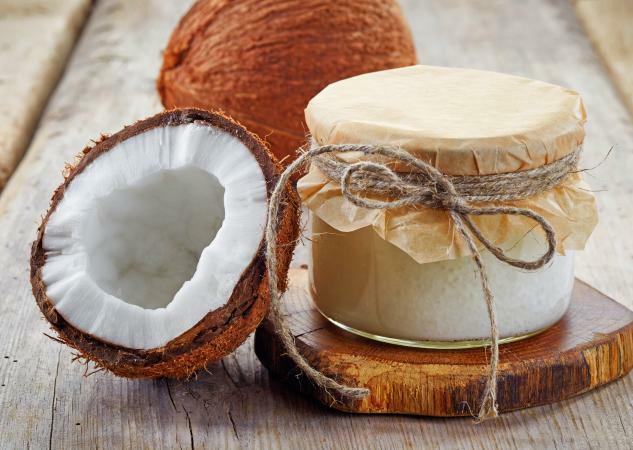 A study exploring the effects of virgin coconut oil and wound healing found that VCO "beneficially affects the wound environment and fastens the healing process." This is true for both new and old scars. The difference is the extent of the scar removal. Older scars are unlikely to go away completely. However their appearance can be reduced with regular and consistent use of coconut oil. The time it takes to see results will vary from person to person. It depends largely on the age of the scar and the type of scarring (for instance, if it is caused by a burn, skin condition, or surgery). Some users with acne saw results in as little as a week while it took much longer for others. Many people with scars have experienced a positive outcome with coconut oil, as seen on YouTube videos, blog posts, and articles praising its ability to reduce scarring. For maximum effectiveness, it is important to be both consistent and patient. While many people have seen results, it important to keep in mind that there is no guarantee that your scar will respond to coconut oil. Dr. Gehrig Harris says on HealthTap that nothing is proven to work on all scars, and severe scars may not change unless treated with plastic surgery or lasers. Generally, coconut oil is a safe topical treatment for scars, but there are circumstances when it should not be used. Using coconut oil for skin can have many positive result, but it is possible to experience an adverse reaction. Some people have an allergy or sensitivity to coconut, coconut oil, and related products. To determine whether this treatment is right for you, start with a patch test. Apply a small amount of coconut oil to the skin and wait a full 24 hours. If there is no obvious issue (like itching, redness, or a rash) then it is safe to use coconut oil for scar reduction. Should a negative reaction occur, cease use immediately and seek out another treatment option. For best results, incorporate coconut oil into your existing skin care regimen. Begin by choosing a brand that offers quality VCO, like Viva Labs Finest Organic Extra Virgin Coconut Oil (available for just over $10 on Amazon). Apply it throughout the day. Ideally, it should be applied to the affected area two to three times. This may seem difficult at first, so try keeping a jar next to your bedside table. (Put it on when you wake up in the morning and shortly before bed.) Another option is to keep it in your desk drawer at work. The more visible the oil is, the more likely you are to use it. To apply coconut oil, put a small amount directly onto the scarred area. Massage in for five minutes and wait an additional ten minutes. This will allow the product to sink into the skin fully. Leave it on or rinse with warm water and pat dry. (Coconut oil can feel greasy, so you may want to remove excess oil during the day but keep it on overnight for added moisture.) Use the oil in conjunction with other ways to minimize scarring, like drinking water, avoiding sunlight, and eating organic foods. There are many different methods to reduce the appearance of scarring. If coconut oil is not doing as much as you would like, do not worry. There are other options available. Book an appointment with your dermatologist to discuss the best course of action. They may suggest dermabrasion (to remove the top layer of skin), laser (either ablative or non-ablative. Ablative removes skin around the affected area while non-ablative stimulates collagen growth), or injections (collagen is injected to scarred areas to replace what has been lost). A professional can help you determine whether an at-home remedy is sufficient or if a more advanced treatment option is required. Scars can affect your outward appearance and inner confidence. By using coconut oil on a regular basis, the effects of scarring may be reduced. The key is to focus on consistency. Apply coconut oil to the affected area as part of your daily skin care routine.